The book, `Laser Physics and Technology', addresses fundamentals of laser physics, representative laser systems and techniques, and some important applications of lasers. The present volume is a collection of articles based on some of the lectures delivered at the School on `Laser Physics and Technology' organized at Raja Ramanna Centre for Advanced Technology during March, 12-30, 2012. The objective of the School was to provide an in-depth knowledge of the important aspects of laser physics and technology to doctoral students and young researchers and motivate them for further work in this area. In keeping with this objective, the fourteen chapters, written by leading Indian experts, based on the lectures delivered by them at the School, provide along with class room type coverage of the fundamentals of the field, a brief review of the current status of the field. The book will be useful for doctoral students and young scientists who are embarking on a research in this area as well as to professionals who would be interested in knowing the current state of the field particularly in Indian context. Illustrations note 19 Tables, black and white; 1 Illustrations, color; 193 Illustrations, black and white; XIII, 345 p. 194 illus., 1 illus. in color. The book, 'Laser Physics and Technology', addresses fundamentals of laser physics, representative laser systems and techniques, and some important applications of lasers. 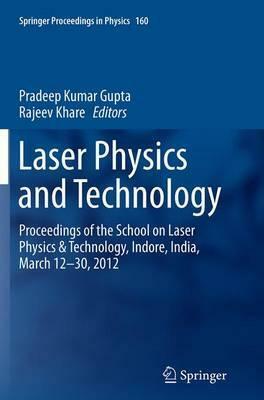 The present volume is a collection of articles based on some of the lectures delivered at the School on 'Laser Physics and Technology' organized at Raja Ramanna Centre for Advanced Technology during March, 12-30, 2012. The objective of the School was to provide an in-depth knowledge of the important aspects of laser physics and technology to doctoral students and young researchers and motivate them for further work in this area. In keeping with this objective, the fourteen chapters, written by leading Indian experts, based on the lectures delivered by them at the School, provide along with class room type coverage of the fundamentals of the field, a brief review of the current status of the field. The book will be useful for doctoral students and young scientists who are embarking on a research in this area as well as to professionals who would be interested in knowing the current state of the field particularly in Indian context. Lasers: An Introduction.- Basics of Nonlinear Optics.- Gas Lasers.- Diode-pumped Solid-state Lasers and Intracavity Frequency Conversion.- Semiconductor Lasers - Basics and Technology.- Fiber Lasers.- Free Electron Lasers.- Lasing in Random Amplifying Media.- Terahertz Transients: Generation and Applications.- Thin Film Coatings for Lasers and Other Applications.- Phase Shifting Laser Interferometry for Measurement of Surface Form Error.- High Resolution Spectroscopy.- Lasers in Materials Processing.- Biomedical Applications of Lasers. Dr. P.K. Gupta is Associate Director at Raja Ramanna Centre for Advanced Technology, and presently Heads its Laser Biomedical Applications and Instrumentation Division and the Laser Materials Development and Devices Division. Dr. Gupta is also a Senior Professor with Homi Bhabha National Institute, a deemed university. Dr Gupta's current research interests include biomedical applications of lasers, biomedical optics and laser materials. Dr. Gupta has over 330 research publications in peer reviewed journals and edited volumes, over 350 conference presentations that include over 80 invited talks and holds three patents. Dr. Gupta is a Fellow of the Indian Academy of Sciences, Bangalore, and National Academy of Sciences, Allahabad. He has received the N.S. Satyamurthy memorial award of Indian Physics Association for the year 1988 for his contributions on mid-infrared coherent sources and the 1998 Homi Bhabha Science and Technology Award of the Department of Atomic Energy, for his contributions in the area of biomedical applications of lasers. Dr. Rajeev Khare received his M.Sc. degree in Physics from Allahabad University. He joined the Laser Division, Bhabha Atomic Research Centre (BARC) in 1986 after graduating from the BARC Training School and worked in the area of tunable dye lasers. Dr. Khare moved to Raja Ramanna Centre for Advanced Technology (RRCAT), Indore in 1988, where he had set-up a laboratory to design and develop tunable dye lasers pumped by copper vapour lasers. He obtained his Ph.D. degree from Indore University in 2000 for his work on resonator schemes for dye lasers pumped by copper vapour lasers. His research interests are mainly in design and development of tunable dye lasers, copper vapour lasers, copper bromide lasers, nitrogen lasers, excimer lasers and high-resolution spectroscopy. Dr. Khare has over 40 publications in peer-reviewed journals and proceedings of conferences and he holds one patent. Dr. Khare presently Heads the Dye Laser Development Laboratory at RRCAT, Indore.